Let me tell you all about my lovely foster dog, Lucy. 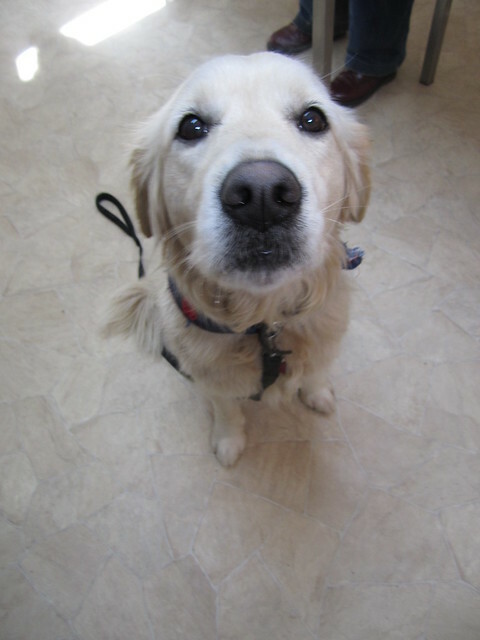 She is a beautiful 5-year-old female de-sexed golden retriever. She greets you with the biggest grin, loves to be a lap dog regardless of her size and just thrives on attention. I first met Lucy in 2010 as she had a very sore eye. Her initial full eye examination made me think she had a severe case of conjunctivitis. After multiple treatments with different eye ointments and oral anti-inflammatories, I was concerned about the episcleral injection displayed in her affected eye that was poorly responsive to all my treatment modalities. 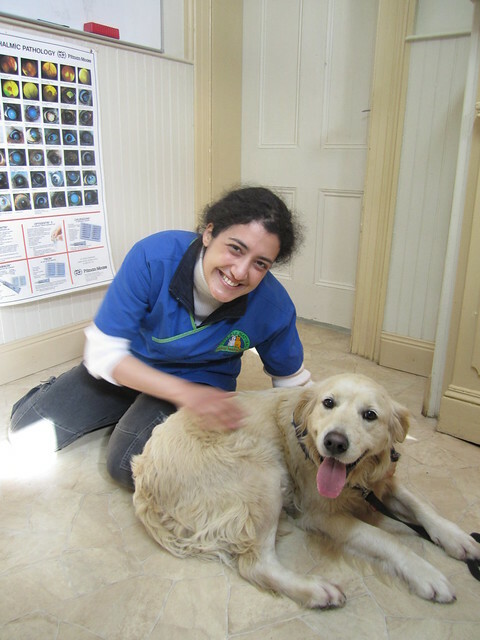 Together, her owner and I decided it was best to refer Lucy to a veterinary ophthalmologist. She was then diagnosed with a rare condition referred to as ‘episcleritis‘ and was treated with a long course of cortisone. She responded very well and her owner did terrific work at closely monitoring any further flare ups. We were warned that this condition may keep recurring in the future and little is known about what really causes it. After that first encounter, Lucy became a regular patient of mine as I had established great rapport with her and her owner. I quickly discovered that Lucy was a very much-loved dog and was adopted as an adult from the RSPCA shelter. She had been in great health until her first bout of episcleritis was diagnosed. She also suffered from an underlying anxiety disorder and always required reassurance and responded really well to positive reinforcement training and the ADAPTIL spray. In the months that followed, Lucy became a frequent flyer as she started developing skin allergies. It initially started with her licking her paws excessively and the development of a few scabs around her head. Her owner was very pedantic and happy to do whatever workup was necessary to get Lucy’s skin issues under control. We started with changing her diet from dry food onto a raw kangaroo meat diet mixed with the Vets All Natural‘s complete mix for sensitive skin. My boss Dr. Bruce Syme created this pet food line to tailor to the growing population of pets with skin allergies. I explained to Lucy’s owner that it will be a lengthy process ranging from 6-8 weeks before we see any major improvements. We also made sure Lucy was up to date on flea control with Revolution monthly spot on therapy. Fortunately, Lucy seemed to be less itchy within days of starting the new diet. Things were looking very promising for her. The kangaroo meat was a novel protein to Lucy and so we were also using it as an exclusive food trial. After a couple of weeks of being on the new diet, Lucy developed a few bouts of itching and breakouts of moist dermatitis lesions around her head and the base of her tail. We treated those with a long course of antibiotics and anti-itch applications (Neocort Cream or Cortavance Spray which both contained cortisone). We were not overly concerned with Lucy’s breakouts as my boss has found pets changing from a highly processed diet to raw food will often experience what he refers to as a detoxification period. This detoxification period is due to the liver releasing stored toxins and will lead to skin flare-up. Basically the length of the detoxification varies with each patient and appears to be longer with those patients that have had long-standing skin issues. For the 4-5 months that followed, Lucy’s skin was going well with no major breakouts. Her owners returned from holidays and picked her up from the kennels and she was looking great. They were very happy to see that she had managed to cope without them for three weeks given her underlying anxiety issues. A few weeks later, they were shattered with the deterioration in her skin status. She was brought straight in to see me. I was taken aback with the bad odor associated with her very oily coat and she was covered with sores from head to toe. The poor girl had basically ripped herself apart. Needless to say, her owner was very emotional and I had to be gentle with extracting all the information I needed to determine what had gone so badly wrong. After a lengthy discussion, the owner confessed that she had put Lucy back onto dry food for 10 days after she picked her up from the kennels simply because she couldn’t afford her special raw meat diet. It became clearly evident that Lucy could never be on processed dry food again. The battle was we were back to square one and she would have to go through another detoxification period. At this stage, the skin flare-up was becoming more recurrent and harder to manage. I was concerned she may have developed an allergy to one of the many components in her sensitive skin complete mix. I was also starting to ponder if she had an underlying thyroid problem. Dogs with hypothyroidism can suffer from major skin allergies that can easily be reversed with appropriate thyroxine supplementation. Every time the owner came back with Lucy for a revisit, I would suggest further workup and the costs were starting to take their toll on Lucy’s owner. Each time she agreed do do another test, she hoped we would get instant answers but all it did was rule out another diagnosis and got us one step closer to a definitive diagnosis. We ran a complete blood test that also included her total thyroxine levels. Her results came back all within normal limits but her thyroxine levels were on the lower end of the range. Instead of spending more money on an expensive blood test to rule in/out hypothyroidism as a diagnosis, we decided to trial treat her with oral thyroxine. As with any treatment trial, you need to be very patient and allow sufficient time to see if it is successful or not. We didn’t see any massive response after four weeks of thyroxine supplementation. Unfortunately, Lucy’s owner was snowed under with the veterinary bills and reached a point where she just couldn’t cope with the stress of it all. It was very hard for her to see Lucy suffering with her skin issues in spite of all her perseverance and dedication to manage it. It was also becoming very expensive and unaffordable. With every revisit, I could sense the rift forming in the human-animal bond between Lucy and her owner. I think the last straw was when Lucy’s skin issues were starting to get beyond my expertise and I preferred referring her to a veterinary dermatologist. That was simply out of the question for Lucy’s owner as that would cost thousands of dollars which she simply didn’t have. The vicious circle of guilt began for both Lucy’s owner and myself. Her owner started feeling like a terrible pet owner. She started contemplating rehoming Lucy as her needs may be better met with someone else. She wondered if a stay home person may make all the difference as she was fairly certain an underlying stress factor was leading to the skin flare-up. Lucy simply loved human company and was left alone for most of the day as both her owners worked very long hours. She thought if she found her the right owner, then Lucy’s skin will probably be better managed. ‘I’ve had enough, I can’t cope with seeing Lucy like this and I am going to surrender her to a shelter’. Upon hearing her utter those words, I heard myself saying with a very heavy heart: ‘Do you realise that Lucy will be euthanized if she is surrendered to a shelter, they simply can’t re-home a dog with major skin issues?’ I gave her the contact names of several no-kill shelters and said I was more than happy for them to give me a call to chat about Lucy’s medical history. Her owner was tormented with the thought of Lucy being put to sleep and contacted every shelter available. This was followed with me taking calls from staff from two different shelters and telling them all about Lucy’s skin disorder and explaining that she was a lovely dog and worth a good go. However, after two month’s of failed attempts at finding her a new home, Lucy was booked in for a euthanasia with me. I had mentally prepared myself for that horrible moment. Lucy’s owner deserved my support in her decision as she had tried her best given her circumstances. As I walked into the consult, I was ready to do the unthinkable. However, Lucy looked straight into my eyes and gave me her most loyal expression coupled with a wag of her bushy tail and I just knew I couldn’t do it. I just couldn’t give up on her as I hadn’t been able to do all the necessary exclusion tests. I felt like I failed her as her vet when I told her owner to take her to a dermatologist. She was still too bright and happy and for heaven’s sake, I hadn’t even definitively diagnosed her skin condition. After a huge discussion, I ended up getting Lucy’s owner to sign a surrender form and I took her on as my new basket case project. Read all about it in my next post!!! ← Is your dog’s scratching driving you mad? What a cute face, I would look after her if she was closer 🙂 Am sure she is a very nice friend to have around like my Pumpkin. Wow, Rayya, that’s very noble of you! She sounds like some of my tough allergic dogs here in Sicily. We always start with a food trial and fortunately that works for a lot of them, but when it doesn’t it becomes much more difficult to manage long-term. Keep us posted! Hey Elliott. Ya unfortunately I haven’t found food trials to be very successful in a few skin cases. It simply means they have allergies unrelated to food. Lucy looks so sweet. Looking forward to your next post. Best of luck to you and Lucy.. She is captivating. You are a very very good person Dr RAYYA , I wish you all the best in this life . This is such a wonderful story and I applaud you for your love and dedication to Lucy with all her problems. I had two Goldens so the story hits home. I cannot wait for the next episode and have my fingers crossed that your beautiful dog will recover and feel safe again. Thanks heaps for your lovely and very supportive comment. Did both your Goldens have very similar skin issues? Oh Rayya, you are wonderful! Hey Cissy. Thanks heaps for your very heart warming comment & positive thoughts. It definitely doesn’t always come easy but it is definitely always worth it in the end from an emotional point of view. I can’t wait to read part 2! Please! I am on “tenderhooks,” as my English-as-a-second-language mother would say. Lucy is gorgeous and deserves a chance, and I’m so glad you are giving her that, Rayya. I hope you find a solution for her, and look forward to your next post on her. Thank you Rayya for stepping up and given this beautiful Lucy a chance. I am sadden that because of money she could not stay with Her Family. ( i can’t say owner as I believe you can’t own a living being only share your life with them) I am happy because you gave her a chance to live. I hope you find the cause for her allergy’s and will be looking for updates on her story.